The whole family loves this meal. 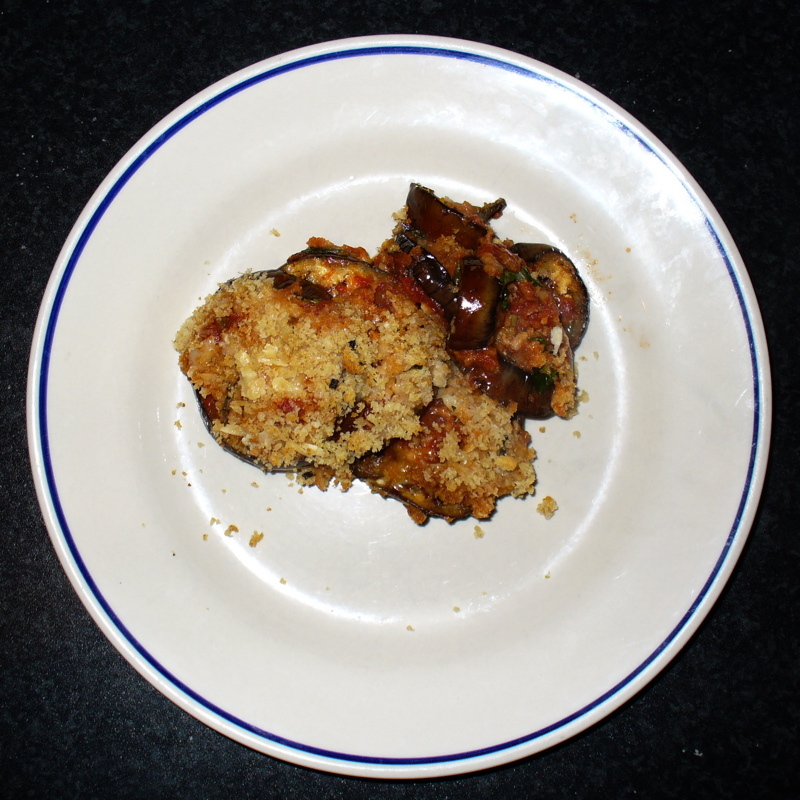 Yes it takes a long time to make all the bread-crumbed eggplant and make the sauce, but there are days it is just worth it. It is also a lovely appetiser for a dinner party and can be made the day before and reheated. The quickest way to do this is to get the tomato sauce going and while that simmers, get the eggplant and bread-crumbs ready. Chop up onion and finely chop garlic. Add with red pepper flakes to hot oil in small sauce pan. Saute until soft. Add tomatoes and oregano. Bring to boil, then simmer for 20 minutes on low. Right before using, add vinegar. Salt and pepper to taste. Slice the eggplant into rounds about 1 cm or ½ inch thick. Grilled -- on a grill pan, quickly cook these so they have a some nice grill marks, but not until they start falling apart, about 1 min a side on a hot pan. In a food processor, rip up the bread and roughly chop some herbs and pulse until fairly fine. Then drizzle in the oil and salt and pepper. Bake in pre-heated 375F (190C) oven for 30 minutes. Copyright © 2004-2018 Peter Mahnke on mahnke.net | This work is licensed under a Creative Commons License.